The SAGE Encyclopedia of World Poverty, Second Edition addresses the persistence of poverty across the globe while updating and expanding the landmark work, Encyclopedia of World Poverty, originally published in 2006 prior to the economic calamities of 2008. 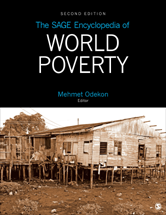 The SAGE Encyclopedia of World Poverty, Second Edition is a dependable source for students and researchers who are researching world poverty, making it a must-have reference for all academic libraries. Bureau of Labor Statistics, U.S.